Club Penguin Cheats by Mimo777 Club Penguin Cheats by Mimo777: More Boxes Added For Underwater Expedition! Dood! 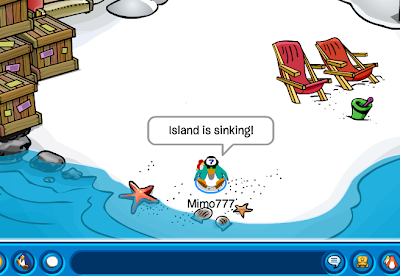 More boxes have washed ashore at the Beach on Club Penguin! And, they are causing the island to start sinking! Just as I said! Hmm, I just have one question... how do you suppose floating boxes are heavy enough to sink an island? Sumpin ain't right there, is it? Yup there's something fishy going on mimo and I know what is in the boxes! One word - anvils! Yup the free item at the beach is an anvil to where on our heads! anonymous herbert has nothing to do with the island sinking, he is sleeping. and echo006 how come we are the only two people who knows that that anvils are in those boxes? Hmm...I wonder if Rookie even took in account that Herbet can't swim. And I wondr if Herbert is going to escape again. I thinks this party will be awesome! Hmmm that's a good question! Perhaps some boxes have nothing in them? not so sure... thanks to evidence of the past it COULD just maybe be herbert... i sense a new game! You should actually checkout how the boxes are in the water as well, Maybe there coming from somewhere else? I guess We'll Fine out soon. If you also see how the boxes are located in the water, Maybe there coming from somewhere else? Who knows, Also listed on the homepage theres that telescope that is being pointed at the Expedition Sign, Maybe we might get a visit from someone? Who knows, We'll just have to wait and see what club penguin pulls of this time. arent u old enough to play that stupid game? 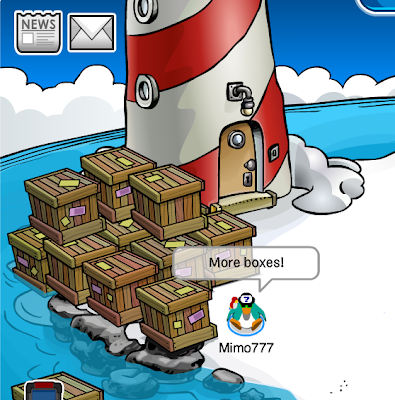 The boxes hold anvils and the reason they float is because science doesn't MATTER on club penguin. Get it? Matter? Science? LOL! Aren't you mature enough to post this in a game cheat blog? Maybe the Blue Crab will rescue HERBERT! !